I picked up this book on a whim (I am at our public library with the kids at least once a week), but I found myself flipping through it constantly throughout this Advent. The author lists--alphabetically, which is darn convenient-all the Christmas traditions, customs, symbols, folklore etc and explains their origins. It has been helpful for me as I try to decide which Christmas traditions to go in for and which to leave behind.At any rate, I found myself constantly fascinated by this little reference book. For instance, did you know that colonial Protestants banned Christmas?? Christmas (or the Feast of the Nativity of the Lord) was an Anglican, Lutheran, and Roman Catholic holiday that made Protestants uneasy, at least in the US, until the late nineteenth century. In general, Puritans, Baptists, Presbyterians, Congregationalists, Methodists, and Quakers absolutely refused to recognize the Holiday in any form until the second half of the nineteenth century. So, the next time some Baptist from Focus on the Family shouts about the war on Christmas, you can laugh even harder. They were the original warriors against it!! In fact, Massachusetts Bay Colony made Christmas illegal in 1659 (though the ban was finally repealed under pressure from the British, in 1681). Growing up near Philadelphia, I never knew what the Mummer's Parade was about. Thanks to this book, I now know that mumming was an old tradition "in which bands of masked and costumed merrymakers roam the streets signing, dancing, action out stories or simply engaging in horseplay" during the Christmas season. And in 1901 the old foggies of Philly, realizing they couldn't contain the populace, gave way and sanctioned the first parade. If you ever wondered what wassail is, who the story behind this Black Pete guy who sometimes hangs out with St. Nicholas, or why mistletoe is associated with Christmas, then you need look no farther than this book. A great Christmas reference book. Its 200 reference cover a wide variety of topics, including Biblical references to Christmas, commercialism, and Christmas in different countries. 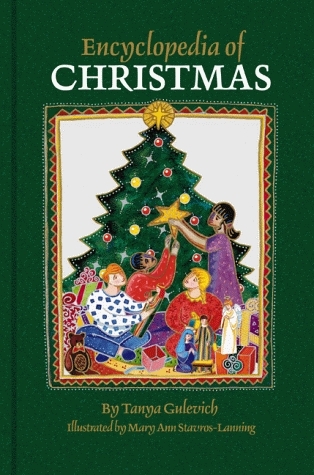 A great book to keep on hand to learn about Christmas. What fun it must have been to research and write!This is the best collection of Christmas information I've found so far. I took it from the library and had to go buy a copy! It covers everything from the sources of old customs to modern movies.